Some of the dogs who come to Lily's Legacy remain at the sanctuary for the rest of their lives. Here, they enrich the lives of those who love and care for them. 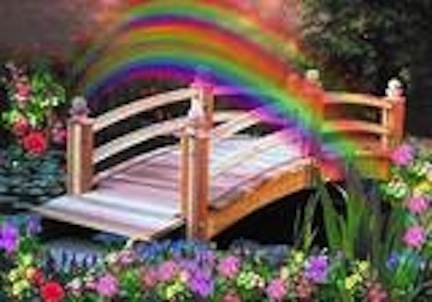 And even when they must leave us for the Rainbow Bridge, they are never forgotten. 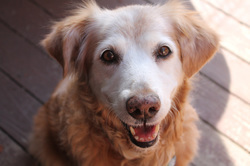 Shelley, almost 16 years old now, came to Lily's Legacy in December 2012 as an owner-surrender. Although Shelley was at first a somewhat solemn girl, she has blossomed under the love and care of Lily's Legacy volunteers to reveal a sweet, goofy personality. At the time, Shelley clearly suffered from hind-quarter weakness which limited her potential adoptive homes. She was unsteady in her gait and dragged her back legs. With acupuncture treatments, supplements, and regular exercise, including swimming sessions, her mobility had improved significantly. However, over the past few months, a neurological problem has slowly robbed her of her mobility in her back legs. Just when she needed it, Lily, who we are sure watches over us all from Rainbow Bridge, sent her an angel who brought Shelley a custom set of wheels to help her get around! We sadly said goodbye to our beautiful Shell Bell in July 2015. Her spirit always greeted everyone who came through the front door. We extend our heartfelt thanks to our wonderful Dr. Rob West. His acupuncture treatments for Shelly assisted her in reaching the age of 16! We send many thanks to Louisa for welcoming Shelly every Saturday for aqua therapy and all those treats she worked so hard for! Dr. Rob graciously came out to the Sanctuary to help Shelly pass peacefully in the arms of Alice. Our beautiful Elsa, what a girl! She is sweet, great with the other pups, playful, happy to cuddle and loves, loves, loves her walks. She's great on the leash, too. Elsa was a stray and came to Lily's from a shelter. She was in rough shape when she arrived but a few baths, grooming, good vet care and lots of TLC and she is ready for her forever home. Addie was a beautiful German Shepherd Dog who graced Lily's Legacy with her presence for over a year. Through our sadness at her loss, we celebrate the love and joy she brought when she came to stay. Addie was a very special soul who taught us that, in spite of tremendous adversity, the capacity to forgive and love and appreciate can not only survive, but thrive. She had been found as a stray by an animal control officer who knew about Lily's Legacy and brought her straight to us. She was estimated to be around 13 years old. In addition to suffering from mobility issues, she arrived with a large wound on her leg and an enlarged spleen, so she remained with us as a sanctuary resident. With her gentle confidence, she became the heart of our resident canine family. Although advanced in age for a German Shepherd, she had a strong love of life until the end. While she was with us, Addie underwent medical procedures that significantly improved her quality of life, was treated to a special diet, and had the full run of the sanctuary. We called her the 'supervisor' for her evident pleasure in watching any kind of construction or facility improvement. We are confident that Lily was there at Rainbow Bridge to greet Addie and has moved her right into a corner office, across from her own, at Lily's Legacy's that-side-of-the-Rainbow-Bridge headquarters. Precious came to Lily’s Legacy in the spring of 2012. She had been found at a shelter and brought to us by a family who could not keep her themselves. She arrived with a multiple health issues, including ongoing allergies. After many months she was once again a healthy girl with only her allergies to be carefully monitored and managed. During the months Precious spent at Lily’s Legacy regaining her health, she ensconced herself firmly in the hearts of all of us at Lily’s Legacy and found her forever-home right here. Precious is a gentle, sweet soul who thinks she is a lap dog, and we are happy to indulge her. Max was entrusted to Lily's Legacy by his guardians at the age of 12 when they could no longer give him all the care and attention he deserves. Seriously overweight upon intake, Max has since shed quite a few pounds and is looking good! However, due to tests showing a problem with his liver, he has become a sanctuary long-term resident. Max is a gentle soul who gets along with everyone and has a calming influence on all our resident canines. Although he loves just hanging out, our volunteers make sure that he gets walks every day (to keep him fit and trim). Max is well-loved by the Lily's Legacy crew, human and canine alike. Greta was a permanent resident, having arrived in June, 2010 as an owner surrender. After Greta became quickly attached to both our executive director and another canine permanent resident, it was decided that Greta would remain a Lily's Legacy dog for the rest of her life. Greta was a spunky girl, our resident "diva," who demands (and receives) lots of attention from volunteers and visitors alike. She greets all visitors with a gift - usually a shoe. Greta is a special girl with endless joy in her heart.